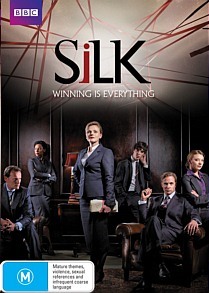 Silk the Complete First Season DVD Review One or two trite moments also go a long way towards ruining any chance the characters, particularly Martha, had of being taken seriously, and though the courtroom scenes are frequently potent and well-written ultimately the viewer is left with a feeling of having seen it all before. Barrister-turned-screenwriter Peter Moffat is no stranger to the perennially popular genre of legal drama, having had a hand in such stalwart series’ as Kavanagh QC, North Square and the Bafta Award-winning Criminal Justice. Once again mining the foibles of his previous occupational environment he returns with Silk, a slick and rather more whimsical take on the concept of courtroom drama. The series stars Maxine Peake as diligent defence barrister Martha Costello, a figure of rare integrity in the dog eat dog world of the Bar, who is hoping to take the next step in her career by becoming a QC. Also applying for the coveted role is ruthless cad Clive Reader (Spooks’ Rupert Penry-Jones), and along for the ride are the pair’s starry-eyed protégés and a host of clients, supporting characters and fellow counsel. Silk features a strong cast and an award-winning writer, yet there’s something a bit off about the entire project. The camerawork is jerky and erratic and several of the thespians involved take an idiosyncratic approach to the whole notion of delivery - mumbling away like a Brando wannabe might sound good in theory but it doesn’t do a whole lot for audience comprehension. One or two trite moments also go a long way towards ruining any chance the characters, particularly Martha, had of being taken seriously, and though the courtroom scenes are frequently potent and well-written ultimately the viewer is left with a feeling of having seen it all before.